PRODUCT DESCRIPTION: Small LCD read out device that keeps track of the high and low temperature for any given period of time based on when it is accessed. If you want to know hourly highs and lows, simply check it hourly and reset it at that time. 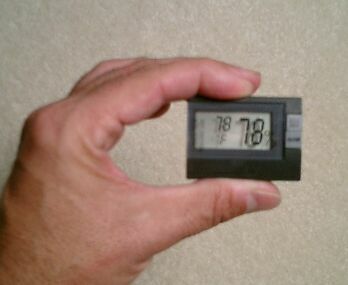 Both temperature and humidity will be constantly measured and their respective high and low reading will be remembered by the monitor. This enables the user to record variances over time so that problem areas can be both identified and monitored following corrective action. WHERE TO USE IT: These devices are tiny and easy to move around in the home so they can be used anywhere moisture is a concern or possibly a problem. They come with their own battery and require no additional power so they are completely portable. Get one and use it around the home in attics, crawl spaces, closets, basements, garages, bathrooms or anywhere you need to monitor. Simply set it out and access it as needed. 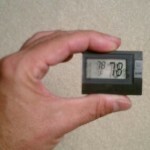 Easy to use and move around, the Humidity Meter is "must have" tool when dealing with moisture problems around the home.